The Van Wert City Board of Education were treated to a robotics demonstration by members of the Van Wert Elementary School Robotics Club, heard College Credit Plus concerns, approved a number of personnel actions, and also heard a multi-phase proposal to renovate Eggerss Stadium. Members of the Van Wert Elementary School Robotics Club brought in their projects and demonstrated robots for members of the board during Monday’s meeting, while advisor Marty Hohman talked about how student interest in higher level thinking and students wanting to know more about electronics was a catalyst for creating the program. She said that the students also attended last year’s local robotics competition in the high school gymnasium and were very interested in robots. 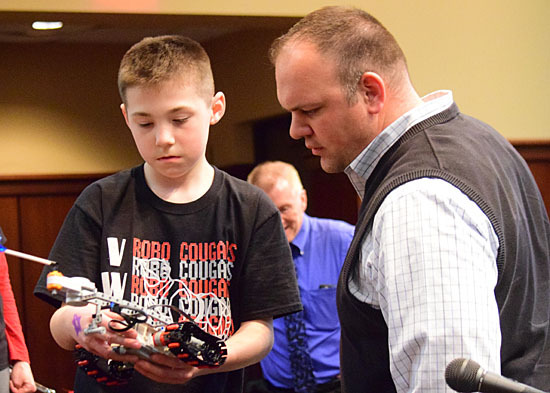 “That was so awesome to me,” Hohman said, adding that she then contacted Bob Spath, who developed the high school robotics program, and he provided them with some spare robot parts and also provided information and assistance for the elementary group. Hohman said Spath and Zane McElroy, the other VWHS Robotics Team advisor, then suggested the elementary students join the First Lego League, which they eventually did. The program has been good for the students, since it teaches them STEM (Science, Technology, Engineering, Mathematics) skills and higher-level thinking and technology skills, including computer programming. “We just decided to jump right in,” Hohman said, noting that the process has been daunting at times, but exciting for the students and her. VWHS Principal Bob Priest also talked about College Credit Plus courses, but said he had some concerns about the fact that some of the courses weren’t as demanding as teachers felt they should be, noting that some courses did not measure up to the Advanced Placement (AP) classes already being taught at the high school — or even some regular high school courses. Priest noted that a proposal by teachers to add some of the AP coursework into the College Credit Plus coursework was shot down by the Ohio Department of Education as being a violation of law, since teachers would be acting as adjunct professors, something they’re not allowed to do. “That was disheartening to our teachers,” Priest noted, adding that local educators are struggling with recommending College Credit Plus courses to their students. “We’ve hit some roadblocks there, and are continuing to work through that,” the VWHS principal noted. On a more positive note, Priest said that the high school’s career preparation program is doing very well, with students and parents excited about the program, which provides an alternative to college for those students who prefer to enter the area workforce instead of attending college. Also Wednesday, local residents Larry Mengerink and Kent McMillen approached the board with a multi-phase proposal to renovate Eggerss Stadium and add a new facility that would house new locker room, training, restrooms, and concession facilities as funds became available. A fundraising campaign is planned for the project, if approved, while McMillen suggested that money that the school could receive from a proposed wind farm in the district also be used to help fund portions of the project. Cost of renovating the existing stadium is estimated at approximately $256,000, while the total project cost would be approximately $3.2 million. The board was given information on the proposal to review. Board members also approved a resolution that would allow the district to proceed with renovations at the S.F. Goedde Building that would make administration offices more secure in the future. In personnel actions, the board accepted the resignation of Mitchell Neal, high school social studies teacher, after three years in the district; Cindy Millay, elementary school paraprofessional after three years in the district; and Tom Runyon, Goedde Building custodian, for retirement purposes, after 30 years with Van Wert City Schools. The board also accepted the resignation of Ed Jacob as an assistant high school wrestling coach, effective the end of the current school year, and approved Kenzie Ray as the VWHS football cheerleading coach, and changes to the contracts of boys’ high school bowling coach Chuck Rollins and girls’ bowling coach Nate Simson. The board also approved amending Administrative Assistant Bill Clifton’s contract, reducing it from a 260-day contract to 217 days, with an accompanying decrease in salary, and the following job classification changes: Nellie Schmidt, from media specialist to district media specialist/public relations director; and LeAnne Gorman, from paraprofessional to library media/assistant. Acknowledged the following donations: High School Robotics Club — $12,500 from General Electric Company, $7,500 from James and Adrienne Fowler, $550 from Valam Hospitality Inc. (doing business as Comfort Inn), $150 from Group Properties LLC; Van Wert City Schools Educators Fund — $125 from Edward and Tavie Buhl, $125 from Van Wert Federal Savings Bank, $125 from Van Wert Service Club; VWHS Choir — $200 from the Van Wert Service Club; Elementary Power of Wind Contest $2,500 from Avangrid Inc., on behalf of Iberdrola Renewables LLC; Senior Class Blessings in a Backpack program — $100 from Stoller Farms Inc.; VWMS Renaissance — $1,000 from the Cooper Family Foundation, within the Raymond James Charitable Endowment Fund; VWES Wellness Program — $1,500 from Van Wert County Hospital; School Breakfast Expansion — $1,500 from the Children’s Hunger Alliance. The next meeting of the Van Wert City Board of Education will be at 5 p.m. Wednesday, April 20, in the First Federal Lecture Hall of the Niswonger Performing Arts Center of Northwest Ohio. Approved a resolution calling on the Ohio General Assembly and Ohio Department of Education to seek input and grant local district control as they develop legislation and rules for the reauthorization of the “Every Student Succeeds” Act.